When it comes to stained glass there are many different styles beyond church designs. In fact, there are even more styles than the popular home floral or geometric designs most people are familiar with for homes as well. Not only are there a variety of types of stained glass window designs out there–stained glass is a highly customizable artform too, so you can have a design all your own. One of these less known but fantastic stained glass styles is family crest stained glass. These lovely family heirlooms are customized to fit your family sigil and/ or badge, colors and even your crest’s motto or slogan. Whatever you want to represent your proud family history, can be easily created here at our Kansas City Stained Glass studios. How Are Stained Glass Crest’s Created And What Do They Look LIke? As stated above, each family crest is individually crafted, in-house, at Kansas City Stained Glass. The most common shape of family crests are octagonal but which shape we create it in is totally up to you and your family. Since or stained glass crests are create by hand and are extremely durable, they will become an heirloom of your family lasting for generations to come! But, should you want to move your crest to a different home, they also come with a lifetime transferable warranty so they can be passed on to the next generation. If properly maintained these works of art will last 80-100 years before needing repair! Can I Give a Stained Glass Family Crest As A Gift? Yes, family crest stained glass makes a lovely gift too! A piece of family crest stained glass can be made as either a window or a free hanging panel. The best part about giving the gift of family crest stained glass is– it is something for the whole family to celebrate and enjoy, These crest represents the proud heritage linked to your family and are simply stunning. We have done crests for schools, fraternal organizations, and similar organizations, so this is a perfect gift for those who are hard to buy for. 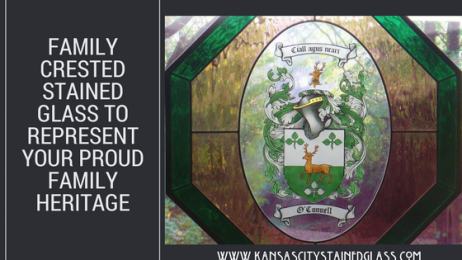 For more information on our custom stained glass creation or to talk to someone about a family crest for your Kansas City home, contact us today!